Spec. Harpal Singh, with Charlie Company, 3rd Battalion, 60th Infantry Regiment, watches as his fellow Soldiers go through the Slide to Victory obstacle at the Fort Jackson Confidence Course. Sgt. Maj. Anthony J. Moore, the uniform policy branch sergeant major inside the Army’s G-1, said the policy change was made largely as a way to increase diversity inside the service and provide more opportunities for Americans to serve in uniform. Female Soldiers have been asking for a while for permission to wear “locks,” or dreadlocks, Moore said. All female Soldiers can opt to wear dreadlocks, Moore said. 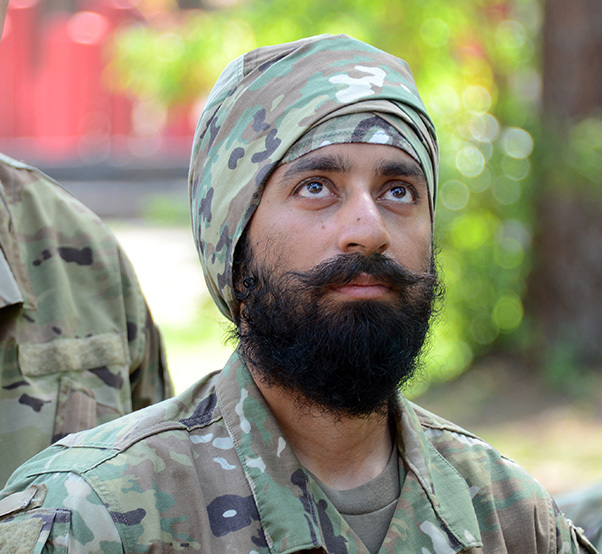 The Army has granted waivers to Sikh Soldiers since 2009 to wear a turban in lieu of issued Army headgear and allowed those same Soldiers to wear the turban indoors when Army headgear would normally be removed. Moore said for those Soldiers, the waivers were permanent, but that it was unclear whether this was the case Army-wide. That is no longer true, he said. The new policy is that a Soldier seeking religious accommodation to wear a turban must make the request only once, and the accommodation will apply to the Soldier for the Soldier’s entire Army career. In an Army directive dated Jan. 3, then Secretary of the Army Eric K. Fanning made official the policy regarding the wear of turbans, beards, hijabs, and under-turbans. “Based on the successful examples of Soldiers currently serving with these accommodations, I have determined that brigade-level commanders may approve requests for these accommodations, and I direct that the wear and appearance standards established in … this directive be incorporated into AR 670-1,” Fanning wrote in the directive. “With the new directive, which will be incorporated into the Army regulation, religious accommodations are officially permanent for Soldiers,” Moore said. The level at which requests for such accommodation can be approved has also changed. Whereas requests in the past rose to the Pentagon before they could be approved, permission can now be granted by brigade-level commanders. Bringing approval down to that level, Moore said, speeds up the approval process dramatically. Moore said the same religious accommodation rules apply for Soldiers seeking to wear a beard for religious reasons as well as female Soldiers who want to wear a hijab. If brigade-level commanders feel it inappropriate to approve the accommodation for some reason, he said, then they can recommend disapproval, but the recommendation must be channeled to the GCMCA for decision. Under the new policy, requests for religious accommodations that are not approved at the GCMCA-level will come to the secretary of the Army or designee for a final decision. Moore said that until further testing is completed and alternatives are found to protect bearded Soldiers in environments affected by chemical weapons, Soldiers with beards may be told to shave them in advance when there is specific and concrete evidence of an expected chemical attack. If a chemical warfare threat is immediate, Moore said, instructions to Soldiers to shave their beards would come from higher up, at the General Court-Martial Convening Authority-level — typically a division-level commander. Likewise, Soldiers who seek religious accommodation to wear a beard will not be allowed to attend the Army schools required for entry into chemical warfare-related career fields, Moore said. For wear of the beard, Moore said, the new directive allows for beards to be as long as the Soldier wants, so long as the beard can be rolled up and compressed to less than two inches from the bottom of the chin. Additionally, for those Soldiers wearing a beard under a religious accommodation, the rules for wearing a mustache are also new. Mustaches may extend past the corners of the mouth but must be trimmed or groomed to not cover the upper lip. Maj. Kamaljeet Kalsi, a civil affairs officer in the Army Reserve’s 404th Civil Affairs Battalion at Fort Dix, N.J., is a Sikh Soldier who wears both a turban and a beard. He said he welcomes the new policy change as an indication that the Army is now looking to accommodate his faith and open its doors to talent in the United States that might have been previously untapped. Capt. Simratpal Singh, with the 249th Engineer Battalion prime power section, said for him the policy is about acceptance. Because the next edition of AR 670-1 is expected to be published next month, the Army will not be able to include the new rules. But Moore said Soldiers can expect to see these most recent changes in the AR 670-1 that comes out at this time next year.